A good friend did well in a chess competition so I made this card to congratulate them, it is also an entry for the Chocolate Baroque Colour Challenge 10 and the WOW Embossing Powder Challenge for May. 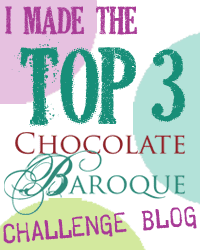 1) Cut 3 triangles in, one each in orange, raspberry and purple. 3) Using a protractor measure out 9 degree (45 degrees divided by the 5 segments) and then use a ruler to mark the line on both the raspberry and the purple cards. 5) Taking the first purple segment, matt this onto the card up against the orange triangle, then take the 2nd segment from the raspberry triangle. Repeat this process alternating the colours until you have a striped triangle underneath the orange one. 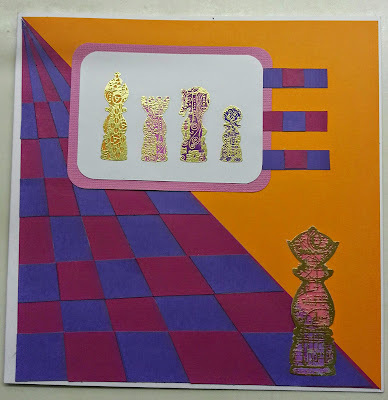 8) Using versamark stamp 4 chess pieces on to white card stock and emboss using the gold powder, and colour them in making each piece a different colour using the spectrum noir pens. Use a corner rounder to finish it off. 9) Using the queen stamp, load it with versamark and stamp onto vellum. Be carfeul when using the heat tool so as not to burn them vellum, colour the queen in using the BP2 ans then cut out using your craft scissors. 11) Assemble the card as above.